The 2013 Cadet World Championships continued to enthral a receptive Miami audience on Friday during the second day of competition at the Doral Legends Ballroom. Four categories were in action on day two as the girls -48kg and -52kg talents took to the tatami along with the boys -60kg and -66kg categories. 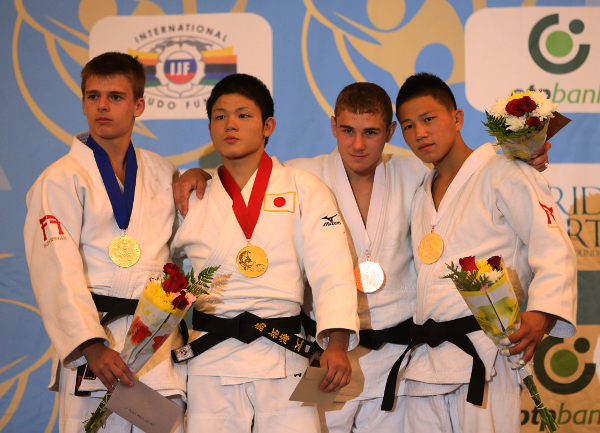 Japan enjoyed the same success as they did on the opening day as their new generation of judoka continued to impress. The -48kg and -60kg world titles went to the land of the rising sun as judo fans were exposed to the latest judoka off the famed Japanese production line. 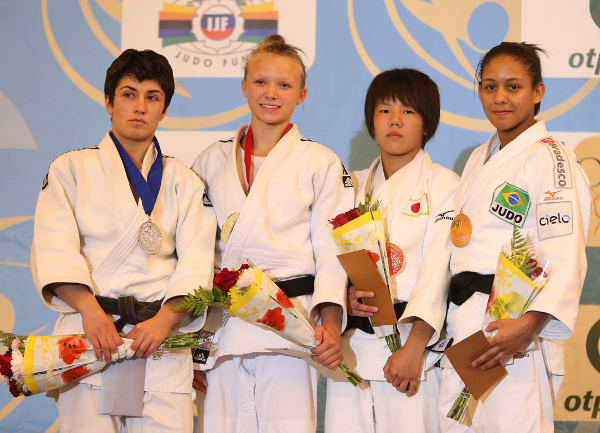 There was also joy for Georgia who were represented by a female on a world medal podium for the first time and they took the top honour in the -66kg category. Mongolia made a breakthrough of their own on the opening day with their first medal at this level and repeated that achievement today as they showed that they are ready to be a leading force on the cadet stage as they are at senior level. After two days of competition, which is the halfway point, Japan lead the medal table with four gold medals, one silver and one bronze ahead of Georgia and Azerbaijan. 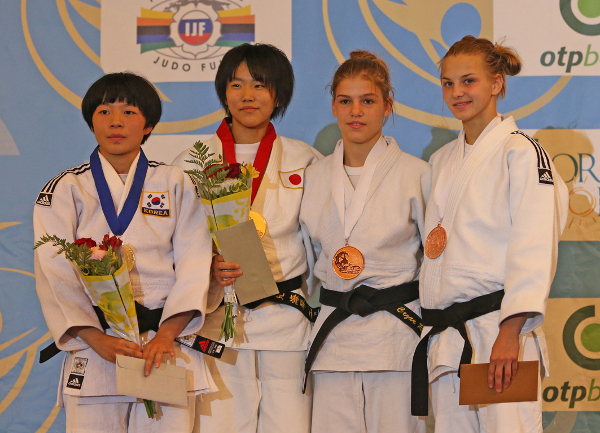 TSUNEMI Mikoto (JPN), who finished in ninth-place at the Berlin Cadets European Cup recently, performed to the best of her ability when it mattered the most as she trumphed in the -48kg final against LEE Hyekyeong (KOR). TSUNEMI and LEE traded shido penalties and the Korean judoka was 2-1 behind with no scores registered at the halfway point. LEE was overwhelmed in ne-waza as Japan showed their ruthless precision when TSUNEMI unlocked her legs from those of her opponent and reached out to hold down the Korean with a kesa-gatame for ippon. LEE notably booked her place in the final by overcoming European Youth Olympic Festival silver medallist Betina TEMELKOVA (BUL) by scoring a yuko with 20 seconds remaining which was the only score in the four minute contest. TSUNEMI toppled Patrycia SZEKELY (GER) at the same stage in just 31 seconds by ippon having already ended the challenge of Cadet European Champion Eloise COMBEAU (FRA) in the second round. The first bronze medal was won by TEMELKOVA who returned to form in repechage against Cadet European Championship bronze medallist Mzia BEBOSHVILI (GEO) as she pipped the Georgian to the medal podium by a yuko. The second bronze medal went to 15-year-old Cadet European Championship bronze medallist Kristina SHILOVA (RUS) who conquered three-time Cadet European Cup winner SZEKELY, also aged just 15, in an absorbing contest. SHIOLVA trailed in the final stages having accumulated two penalties for passivity while her opponent had only been penalised once for the same offence. The perseverant Russian never gave up and just before the four minutes elapsed she trapped the German with sangaku-gatame which yielded ippon. Jessica KLIMKAIT (CAN) shone for Canada as she won four of her five fights by ippon including the final against Mariam JANASHVILI (GEO). JANASHVILI was already assured of becoming the first Georgian female to win a World Championship medal as she took her place in the final but the contest was all about the endeavour and energy of the Canadian who went ahead from a seoi-nage attempt which earned a yuko. KLIMKAIT showed she was equally adept in osaekomi-waza as she held down the Georgian with a kesa-gatame for ippon. JANASHVILI had showed her promise during a come-from-behind victory against Berlin Cadets European Cup winner MAEDA Chishima (JPN) in the semi-final with a ko-soto-gake and ura-nage adding up to wazari-awasette-ippon. The -60kg category was the busiest of the competition with 56 judoka and only a special talent was going to emerge from a gruelling day of judo to capture the gold medal. 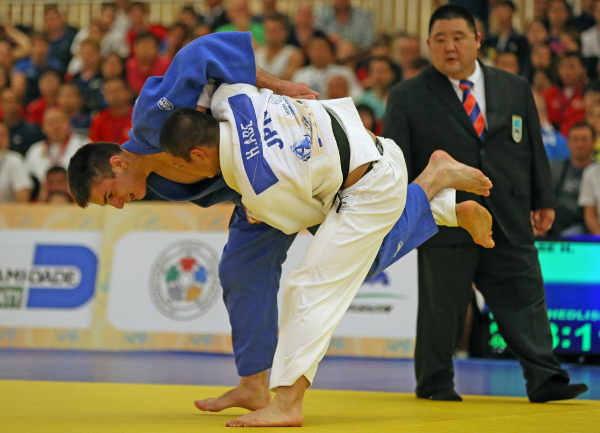 OSHIMA Takumi (JPN) threw Bogdan IADOV (UKR) with an uki-goshi for ippon having been pushed all the way by Tsogtbaatar TSENDOCHIR (MGL) in a thrilling semi-final only progressing due to the Mongolian receiving a shido. The first bronze medal was won by European Youth Olympic Festival silver medallist Dzmitry MINKOU (BLR) who dominated Cadet European Championship bronze medallist Harutyun DERMISHYAN (ARM) and sealed his place on the medal podium by throwing the Armenian with an explosive drop seoi-nage. The second bronze medal was clinched by TSENDOCHIR who bested Berlin Cadet European Cup silver medallist Jolan FLORIMONT (FRA). The highly-active Mongolian looked sharp all day and had shown he was at ease in both tachi-waza and ne-waza. On this occasion he went ahead with a waza-ari and repeated that feat with a sangaku-gatame for wazari-awasette-ipoon. Cole CHANDLER (USA) was among the USA hopefuls on day two and he showed his shime-waza prowess by executing a perfect kata-te-juji-jime to defeat Lorenas AZUKAS (LTU) and energise the crowd but the American lost out in the second round against RYU Seunghwan (KOR). Cadet European Championship bronze medallist Koba MCHEDLISHVILI (GEO) overcome Cadet Asian Championship winner ABE Hifumi (JPN) won had won his three previous contests by ippon. MCHEDLISHVILI halted Japan’s golden run in arguably the contest of the day as both judoka were relentless in their pursuit of the world crown. ABE could not adjust to the gripping style of his opponent and Georgian, who barely had the energy to stand at the end of the contest, took the title by throwing ABE for a waza-ari. The first bronze medal was presented to former Cadet Asian champion Didar KHAMZA (KAZ) who bested Uzbekistan Cadet Championship bronze medallist Sukhrob TURSUNOV (UZB) two minutes into their contest. TURSUNOV tried to lift KHAMZA up for an ura-nage but the Kazakhstan judoka was alert to the threat and used his opponent’s momentum to turn him over onto his back for ippon. The second bronze medal contest saw Berlin Cadet European Cup bronze medallist Pavel ERSHOV (RUS) and Albert MKRTCHYAN (ARM) go toe-to-toe. 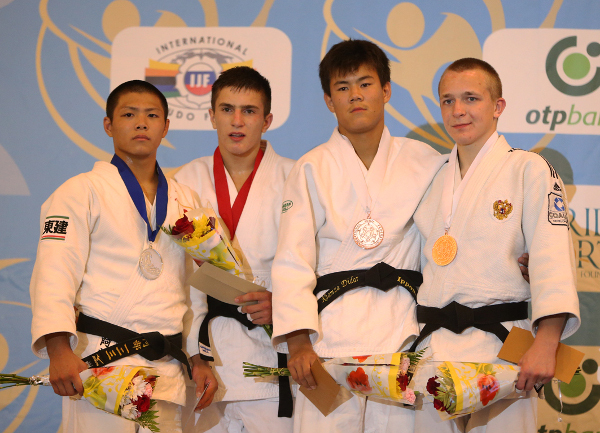 ERSHOV emerged with a narrow win from a yuko to capture the final spot on the -66kg medal podium.